Putting purchasing decisions in the hands of employees has many benefits, such as simplifying processes, saving time and ensuring the right materials are purchased. At the same time, procurement organizations are still responsible for managing cost and compliance with proper controls and visibility into spend. Most procurement organizations are working hard to bring a larger proportion of corporate spend under management. This is especially true for indirect spend such as office supplies and maintenance, repair, and operations (MRO) materials, which is often controlled at the department level – therefore having a high-level view of spend across the company can be challenging. Purchasing for such items is already decentralized; empowering employees with buying authority can seem counterintuitive just when procurement is making inroads into consolidation. Perceiving freedom and control as opposing forces can lead to an emphasis on more process and enforcement. Employee purchases may be limited to contracted suppliers, or must work through professional buyers in the procurement department. Even smaller items could be subject to detailed specifications and RFPs. While in theory these controls should lead to greater compliance, they can sometimes lead employees to look for workarounds so they can be fast and effective at their jobs. Technology can help avoid potential friction between procurement departments and users. By prioritizing visibility and communication over prohibition and control, it is possible for procurement to function as a partner to employees who have purchasing power at the department level. One way to leverage technology to promote expediency and trust is to use a curation-based approach. As opposed to strict limits on what employees can purchase, curation gives employees the information they need to make the best decisions, which builds trust and provides flexibility. With Amazon Business, for example, curation means empowering procurement teams to mark items as “preferred” or “restricted.” Preferred items show up first in searches and are clearly marked. Procurement can determine which items are best for the business’s budgets and needs, and make it easy for users to purchase them. The organization can decide the criteria for defining preferred status for specific items and communicate those accordingly. Items designated as restricted can have messaging associated with them that explains why it is marked. Restricted status can be set up at the product category level, giving procurement the flexibility to manage purchasing that is in line with company policies across a wide range of products. Restricted items can also be associated with approval workflows A user can still add a restricted item to their order as normal, and the order is funneled to the designated approver for easy review. Technology is also critical in balancing control and trust within an organization. It can make people’s jobs easier, helps them achieve more, faster, and empowers them to use their knowledge and experience more effectively. With purchasing specifically, the more purchases users make using an approved solution, the more insight procurement has into spend patterns and business needs. When evaluating technology solutions, procurement departments should emphasize visibility and analytics in order to better understand how the organization is spending overall. At the same time, users can still purchase items, even those designated as preferred or restricted (with approval), more efficiently and quickly. Company culture can also be a factor in how much businesses enable self-service procurement. Some organizations may emphasize greater autonomy at the employee level, while other organizations may prefer retaining more control. However, with the right technology and tools today, many companies are choosing a third path: empowering users to do what they do best while using communication, curation, and pragmatic policies to build a culture of trust and flexibility. 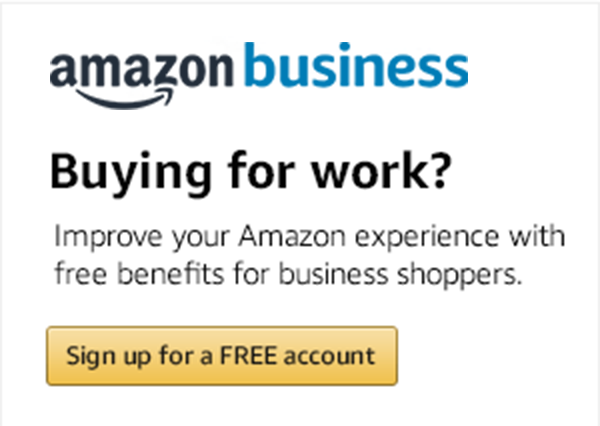 Create a free account to explore how Amazon Business can be tailored to your specific business needs.